Petunias are popular annual plants, widely planted for a number of good reasons. In a range of bright colors and both single and double forms, petunias are easy to grow, grow quickly, and have a long blooming season. Petunias can be planted in borders, mass plantings, or in containers or hanging baskets. However, petunias can often become long and leggy, and at that point, blooming will slow down. With proper care, petunias will continue blooming all summer and well into the autumn months. Pinch the tips of young petunias when the plants reach about 6 inches in height. Pinching will force the petunia plants to grow outward in a bushy, full shape rather than growing tall and spindly. Prune leggy petunias back severely with garden shears, leaving about half of their length intact. If the petunias are severely leggy, it's safe to cut the plants back to just 2 or 3 inches of stem, as long as a few leaves are left intact. Stagger-prune the petunias so that you still have plenty of petunias blooming in the flower bed. Prune every third petunia plant, leaving the remaining 2/3 of the petunia plants unpruned. For each of the following two weeks, prune another 1/3 of the petunias. 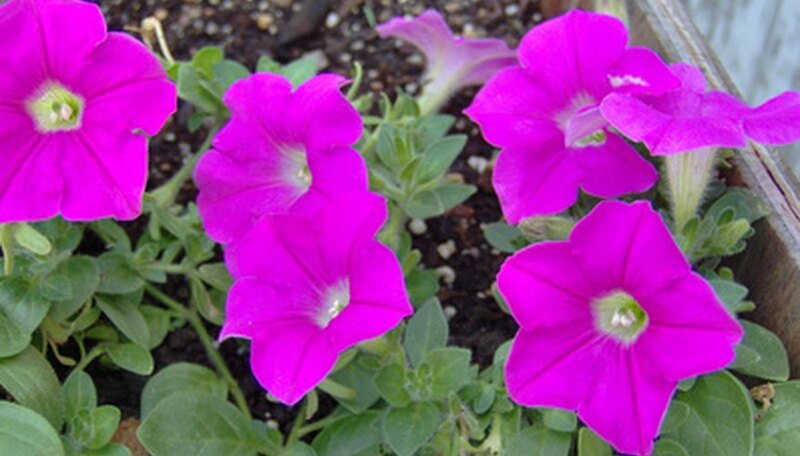 Water petunia plants after pruning, then apply a liquid fertilizer for blooming plants. Be sure to plant petunias in full sunlight. Petunias planted in shade will stretch for the sunlight, creating long, leggy plants. Deadhead, or remove, spent petunia blooms regularly. Deadheading will force the plant to continue blooming for as long as possible and will help prevent long, leggy plants.